1 of 2 Peel and cube large russet potatoes. In a medium pot, combine potatoes with enough cool salted water to cover by an inch. Bring to a boil over high heat. Cook until potatoes are tender, about 12 minutes. Drain well. Mash potatoes with 2% milk, 2 tbsp butter and salt. Set aside; keep warm. 2 of 2 Sprinkle black pepper on 4 boneless, skinless chicken breasts (about 5 oz each), slightly pounded. Top each breast with 2 sage leaves. Wrap 1 slice prosciutto over each breast. Heat 1 tbsp olive oil in a large nonstick skillet. Place chicken, prosciutto side down, in skillet; cook until prosciutto is nicely seared, 2 minutes. Turn chicken over; cook until internal temperature registers 170 degrees on an instant-read thermometer, about 3 minutes. Remove to a warm plate. Add sweet vermouth to skillet. Scrape any browned bits from bottom of skillet; cook 1 minute. In a small bowl, stir chicken broth and cornstarch. Add to skillet. Simmer, stirring until thickened, 1 to 2 minutes. Remove from heat and stir in 1 tbsp butter. 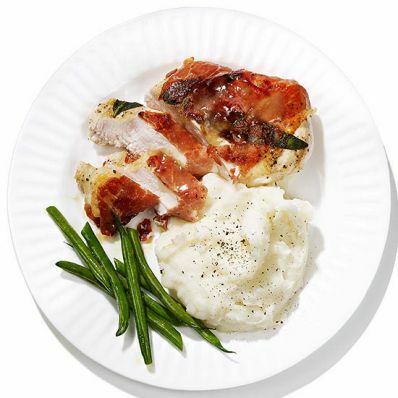 Pour over chicken and serve with mashed potatoes and steamed green beans.